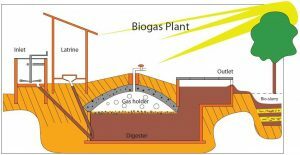 Biogas | What is Biogas and Where Can You Use It? Naturally made from the combination of carbon dioxide and methane, biogas is gradually becoming a feasible and practical energy source. Its most significant attribute is the fact that it is renewable. The production of biogas happens during the decomposition of organic matter via the process called anaerobic digestion. When waste coming from animals and plants gets broken down by bacteria with the absence of oxygen, there is a release of the carbon dioxide and methane gases. Know that biogas is an environment-friendly solution and comes with a wide range of possible applications. You can use it for cooking, drying, heating, cooling, and others. Likewise, there are efforts to use it for producing steam, electricity, and methanol. The primary use of biogas in the domestic setting is for cooking. The innovative solution uses a digester and a tube. The advantage of using it for cooking is that it won’t produce as much pollution as other fuel sources. Also, it is interesting to know that you do not wait for the heat after ignition since it creates the energy in a matter of seconds. The by-product of biogas used in cooking may be utilised as fertiliser. Furthermore, there also is a prospect of using biogas for producing electricity. For instance, the external combustion process in Stirling motor with the help of heat exchanges allows for the generation of electricity. However, you do have to acknowledge that efficiency rating is low. One of the things that make biogas advantageous is that you can use its by-products for agricultural purposes, specifically in producing organic fertilisers. The reliance on biogas makes sense since it reduces pollution and does not harm the environment. As a potentially cheap source of energy, the technology needed to produce biogas is readily available, and there is no need to shell out a considerable monetary investment to take advantage of it. Another exciting fact about biogas is that it is clean and renewable. The gas generated via bio-digestion will minimise or reduce the likelihood of greenhouse gas emissions. The reason is that the process does not involve any combustion or burning process. It makes perfect sense to commit and invest in the use of biogas as an alternative source of energy since it addresses the most pressing issue the world faces these days, which is environmental degradation. Biogas plants have what it takes to curb the greenhouse effect since they naturally lower methane emissions by way of trapping the harmful gas and making use of it for fuel. Finally, the production of biogas and the corresponding campaign of introducing it to domestic or residential settings will eventually reduce the reliance on the likes of oil and other fossil fuels. There comes a time when it becomes the primary source of energy.